Hemmings Motors is advertising an interesting 1965 Austin Mini for sale in Santa Monica California. Classic Car Photography has a soft spot for Minis of all types and we’re always on the lookout for Mini Shows to attend, and for interesting Minis where-ever they may be. We were quite interested to see this somewhat different 1965 Austin Mini advertised for sale in California. Must sell. Moving. This is a custom build by noted automotive designer Chris Humberstone (Chris Humberstone Coachbuilders, UK) built it up from a new Clubman bodyshell configured to be a left-hand-drive (LHD) model to be exported to U.S. Titled as 1965 Austin – the body shell was deseamed, then fitted with electric windows and an electric sunroof. California titled with current registration. Runs and drives great. Engine: 1275cc — 4-speed, 4-syncro. New Brakes, New Exhaust, New Tires on Mamba Rims. I’m not quite sure how they get away with calling it a 1965 Mini, but ….. Also, it should be noted that this Austin Mini is being sold under “fire-sale” circumstances and the price advertised by Hemmings is likely to be way under the car’s true value. Click Here to visit the Hemmings advertisement for this interesting Mini. The mini did not sell at Hemmings and is currently being advertised on www.miniguy.com. 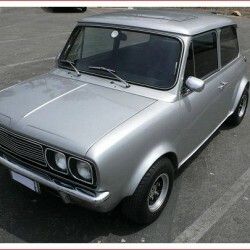 my first car was a 1965 morris mini super deluxe, ordered direct from morris motors ( i worked there) in island blue, and I loved it, I did later have mini clubman in white and beige interior, would still have it if it looked like the featured car., this car car is awesome and is a credit to the owner, would love to have it myself, but I live in Australia.